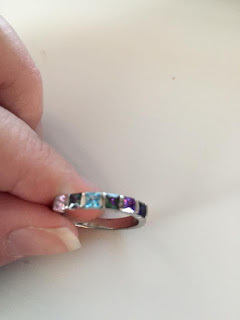 I was so excited to review something from Mama's Jewelry this year! 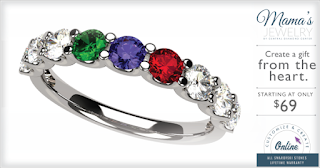 Growing up my mom had a ring with each of us kids' birthstones on it. I always loved the idea and thought one day I would like one as well. Since I wasn't sure until recently if I was done having kids or not, this idea wasn't really an option, but now that I'm 99% sure I'm done (barring any celestial intervention), it was a good time to get a ring symbolizing all 6 of my kiddos. And it's a good thing too because these rings can only be customized for up to 6 stones anyway- it's like it was meant to be haha! When I went to order, I loved how their website updates and shows you the example of exactly how your ring (or other jewelry) will look. It made me fall in love with my ring before I even had it! The style is exactly my style too. Design & order your own personalized ring here. 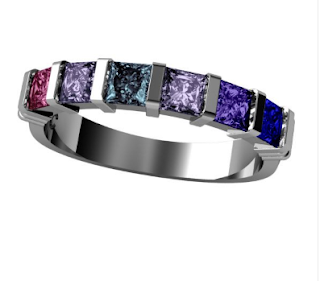 First of all, the 2 light purple ones are June- Alexandrite, and change color- just like they are known to. I love it! Some times I look at my ring and they're green, other times purple, and other times blue. This was the best Mother's Day gift ever! I wear it every day and love the reminder of each of my kids.